We believe in one Triune God – Father, Son and Holy Spirit. We believe that God created us and all creatures, and that he endowed us with an immortal soul. We believe that we were created by God in perfection, which we lost when we aspired to become like God and fell into sin, which is disobedience to God’s will. So, God sent his one and only Son into the world to redeem us. The Bible says: “For God so loved the world that he gave his one and only Son, that whoever believes in him, shall not perish, but have eternal life.” (John 3:16). We believe we will live in eternal bliss by the grace of God – not by our own merit. We believe it is a privilege to be part of God’s family, the holy Christian church. As God’s children our task is to spread the love of God through proclaiming the Gospel (God’s love) in our world that is so filled with hatred. We also believe that each person has the right to believe according to their own heart and that no one has the right to force their religious beliefs on any one else. In that spirit, we freely offer God’s love to everyone. We welcome anyone in the name of Jesus Christ to join us in worship. 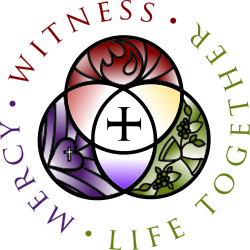 Together these phrases illustrate how the church lives and works together to proclaim the Gospel and to provide for our brothers and sisters in Christ in our congregations, communities and throughout the world.